In the latest of his excellent Classic Programmes series, Scott Knowles looks at a matchday publication from a club of particular interest to me! During the mid 1980’s Hampton Football Club was staffed by exactly the sort of people you would expect to find employed at a Vauxhall-Opel League Division One side in the penultimate decade of the last century. There was an A.N. Duddy as Vice Chairman, an A.P. Mann as General Secretary, and R.J. Parsons and J.F. Hennessey amongst the Committee Members. One imagines that board meetings consisted of equal amounts English Leather aftershave, nicotine tinged moustaches, and frequently raised voices. The peculiarly uncredited opening programme notes add to this sense of furrowed-of-brow men getting business done with slightly stern sounding offerings like – “Full details of the visitors are given elsewhere in this programme, so I won’t waste space repeating myself.” – like a deputy headmaster grumpily accosting a student. Meanwhile a reminder that smoking is not permitted in the main stand following an inspection brought about by the fire at Bradford City is a sombre reminder of the general lack of regard for safety that was routine at all football clubs back then. The programme itself is deceptively slender but, for the 25p asking price, packs a lot in. There is all the usual fare you would expect from a match day publication like a comprehensively written history of the opponents, fixtures and league table section (the league being topped rather bizarrely by Teenage Mutant Ninja Turtles villain ‘Leatherhead’ at this time), and a generous sprinkling of of-their-time advertisements. There are, however, some more unusual bits and bobs included that help it stand out as one of the best of its time. There is, for example, a non-league quiz that you imagine even in 1985 was particularly taxing (sample question – On which Football League ground do Pegasus Juniors F.C. Play their Hellenic League fixtures? 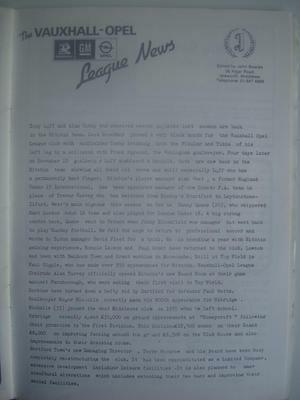 ), the promotion of a Halloween Night Dinner complete with promise of “live music for dancing” – as opposed to the live music you do architecture to – and a League News section that reports on the return of two Hitchin Town players struck by serious injury the prior season – Alan Cosby who had suffered a break to his fibular and tibia, and goalkeeper Tony Luff whom, following a shattered knuckle, it is explained now has a “permanently bent finger”. The names of the players alone are a joy to read – the likes of Paul Giggle, Terry Vincent, and Ronnie Lawson who you could just as easily imagine as characters in a Roy of the Rovers story – meat headed and red of cheek, shaking off their fractured fibular or shattered knuckle to cross the ball in for Roy Race to volley home in a cup final at Wem-ber-ley. 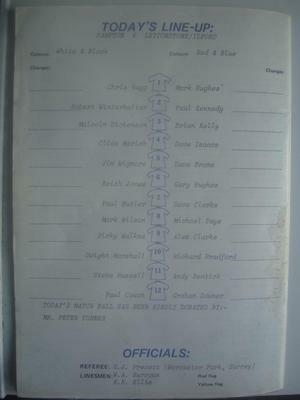 The real gem of the programme, however, is found in the Matches From The Past section which reports on a London Senior Cup game from 1962 and appears to have been penned by a particularly frustrated novelist. Mentions are made early on of “prophets of gloom”, the “vigour and skill” of Hamptons goalie, and the bravery of the home sides players in “refusing to be trampled underfoot by the machine like efficiency” of the opposition players. There is a mildly nightmarish quality to the descriptions at times – the Hampton goalkeeper is “taunted” by a left winger before being forced to concede a third goal and a penalty strike is “screamed chest high” at him not long after. It’s not something often seen in today’s equivalent ‘matchday magazine’ where reports of matches tend to be a straightforward record of the events told in the matter-of-fact manner of a dead eyed contestant on The Apprentice – with passion and any semblance of joy of the game wrung dry in favour of a bloodless neutral perspective of things. Pure poetry and a joy to read. For shame today’s programme writers. For shame. Posted on October 24, 2012, in Kieran's Classic Programmes and tagged Classic Programmes. Bookmark the permalink. Leave a comment.